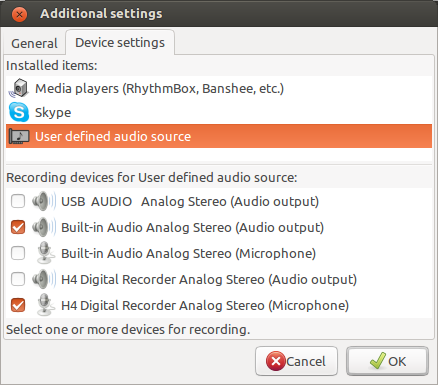 I tried to record a Skype conversation with an interviewee, but for some reason, I couldn’t get the otherwise-great Audio Recorder to record Skype. When I clicked ‘Start Recording’, it would change the button to ‘Continue Recording’ and just sit there. Later on, Skype crashed anyway. That’s what happens when you have proprietary app with closed code wrapped up to try to work on Linux. Much as I would love it if all my guests used a SIP client (like Ekiga), I don’t think I can expect people to set that up, register for a username and so on – that’s more than I can hope for. Many people already have a Google account, so what I can hope for is for them to follow the steps below, so we can have a chat that plays nicely with Audio Recorder. A new window will open, asking you to install the Hangout plugin. Do so. Once the installation is verified, a Hangout will start, where you can invite others to join in and chat. That takes care of he two people chatting. What about recording them? 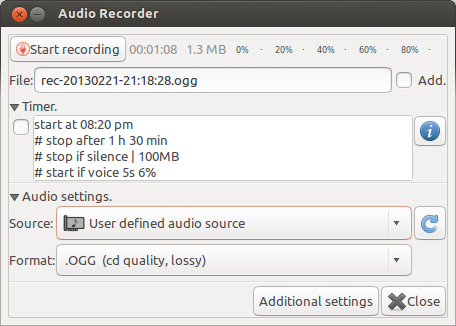 You now have a recording source that combines the output from Google Hangout with the input from the microphone. When you’re ready to talk, hit record and both sides of the conversation will be recorded. I used this method in Episode 6, when I interviewed Robin Deacon – him in Chicago, me in Oakland. There are a couple of issues with the results. Firstly, the sound from the remote party sounds a little distorted and compressed. I don’t know what causes that, except for the fact that it’s a stream of audio coming live over the net. Maybe if I switched off the video stream, it would improve the audio. Secondly, when I spoke, it would duck out the remote part of the audio – it would silence it and “push it out of the way” – I don’t know how to describe it. This meant that it was hard to have a natural conversation with the subject, because I couldn’t talk over him for fear of ruining the audio. Combine that with my still-primitive (but improving!) interview technique, and I’m not 100% happy with the results. It was a great episode though, and it’s good to have another way to record a remote conversation.